Description: Shrub or small tree to 8 m high, branchlets mostly spinose; spines c. 1 cm long. Leaves obovate or cuneate, 5–20 mm long, 2–10 mm wide, apex rounded or truncate or notched or occasionally shortly apiculate; margins otherwise entire, only the midvein evident on lower surface, glabrous; sessile or subsessile. Flowers solitary. Sepals not seen. Petals 8–10 mm long, whitish. 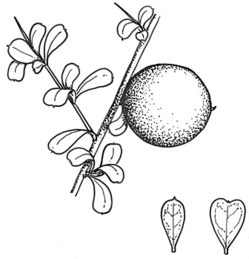 Fruit globose, 15–50 mm diam., becoming glabrous, pericarp thick, hard, ripening to yellow or orange; seeds. Distribution and occurrence: Grows in dry sclerophyll forest, dry rainforest and closed scrub, north from Warialda.